Helps keep the muscular and skeletal structures fit. Assists in the circulation of Vital fluids and facilitates the removal of toxins. Avoids build-up of lactic acid which forms Trigger Points. Assists in Lymphatic and fluid circulation. Speeds Recovery Time. Decreases stress and relieves tension. If you’ve ever scratched or petted your dog, you see how much they enjoy it! Well then, imagine how Therapeutic Pet Massage would feel. Therapeutic Pet Massage is vastly different than just petting or rubbing your pet. Think about the results of a shoulder rub on your body versus the way that your body feels after an hour-long therapeutic massage – the shoulder squeeze may offer you short term results while the therapeutic massage can align your body and effect your entire quality of life. And so it is with canines – competitive dogs increase their speed and there is evidence that Therapeutic Canine Massage affects chronic anxiety, mood, separation issues and even aggression. More importantly, massage increases and balances the circulation of all the fluids in the body (blood, lymph, cellular fluid, interstitial fluid, saliva, urine, and more). That’s a lot of fluids. Why? The movement of a dog’s fluid through their body is different than ours. Dog’s don’t perspire through their skin like us (skin is the largest organ of the human body). Mostly, a dog’s temperature is controlled through conduction. When they are hot, they lay on cool ground. When they are cold, they retain their body heat by curling up into a ball. 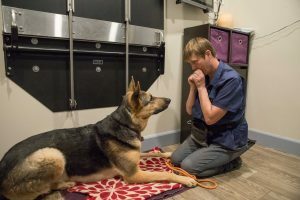 Therapeutic Canine Massage supports the balance and circulation of fluids head to toe, inside to out, all-encompassing and interwoven through the fibrous connective tissue found throughout their entire body. Therapeutic Canine Massage provides a framework that helps support and protect individual muscle groups, organs, and the entire body. If you would like to set up a Therapeutic Massage appointment, please call us for details at 775-853-6900. 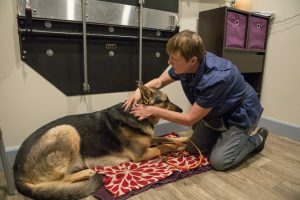 All pets must comply with Nevada State Veterinary Board Regulations (the pet must have been seen by a Mountain View Veterinarian within the last year).